Planning a relocation can be a very complex job. This is true for full-scale property removals, but the same goes for single item transportation from point A to point B. If you have a single bulky piece of furniture, a sensitive appliance or office equipment, or fragile antiques that you would like to make sure they reach their destination safely and on time, without you having to worry about them, there are a few things that you can do. Your foremost goal is most likely to be to avoid damage to your goods while they are being delivered to their new destination. For that purpose, buying durable double-walled removal boxes, industrial grade bubble-wrap and other high-quality supplies is, of course, the sensible way to go. 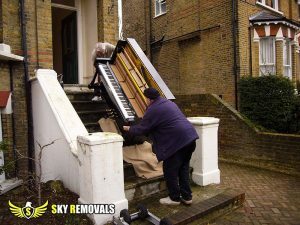 If the bulky object to be moved can be disassembled, do not hesitate to do so. Putting everything back together will be a small price to pay for the easier packing, handling and transportation that you are going to ensure by doing so. Make sure that the box you put the thing into is the right size too, and it is well wrapped and insulated, as to avoid the object wiggling inside. Put labels listing the contents of the box and the right way to handle it on all sides of the package, as a safeguard and a warning toward anyone who might happen to be handling it. If you do not have the right vehicle to transport your goods, or you do not feel confident in your skills, then you should by all means pick up the phone and call your local moving company for secure delivery services in London that will get the job carried out from A to Z without you having to break a sweat or lift a finger in the process. For your own peace of mind, adding Goods in Transit Insurance in the heap will be a great thing to do. Even if the worst happens and there is some damage sustained by your possessions during transportation, you will be reimbursed, which is, of course, a nice thing to have in mind. Avoid the unnecessary risk of complications and injuries and remember that most movers will actually refuse to work in a dangerous environment. If the manufacturer of the furniture, equipment or other bulky objects that you would like to get moved has left any instructions for their safe transportation, by all means, read and follow them. Chances are that you are going to save yourself a lot of stress and strain by doing so. After all, the people who made the goods know best.